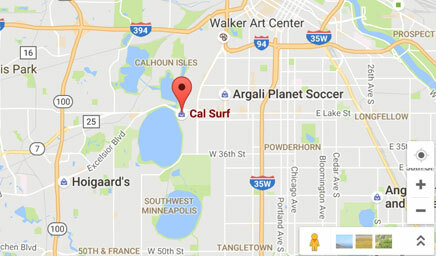 Cal Surf is the Midwest's Premier skateboard and snowboard specialty store. We have been selling and servicing skateboards and snowboards since April Fool's Day, 1988. The store is owned by a skateboarder/ snowboarder and everybody that works at the shop skates and/or rides. You can be assured that your order is being packaged by somebody that understands your passion for skating or snowboarding. Browse our site using the menu on top. When you see an item you want to buy, click on the picture to view more details and a product options. Select the option you want and press the "Add to Cart" button. Your item will be placed into an electronic shopping cart. You may continue shopping after placing an item in your cart. To return to your cart at any point during your shopping process, click on the "View Cart" symbol located at the top of your screen. You can also change the quantities of the products in your cart. When you are done shopping and all items your have been placed in your cart, click on "Proceed to Checkout". You will be asked to give us your billing address and shipping address. You will then see the total amount of your order, including sales tax (Florida and Minnesota shipments only) and shipping charges. Next you will be asked to enter your credit card information. After confirming your selections, click the "Place Order" button. After you click "Place Order", a page will appear that confirms your order and gives you an order number you can use to contact us. You will also be sent a confirmation of your order via email. A confirmation email invoice of your order will be sent at the conclusion of the ordering process. If you misplace this confirmation, we will be happy to forward an additional copy. Sales tax is charged only on orders sent within the state of Minnesota. Minnesota state law requires that we charge sales tax on certain items. Clothing and essential goods are not taxed. Cal Surf ships Fed Ex on most shipments. Whenever it is possible, your package will be shipped within 24 hours. Orders placed Friday evening, Saturday or Sunday will ship Monday. All rates include shipping, handling and insurance. We currently only ship the within Continental U.S. and Canada. Cal Surf accepts Visa, Mastercard, American Express and Discover Card. We also accept money orders. You can safely enter your entire credit card number, via our secure server, which encrypts all submitted information. We will bill your credit card the day we receive your order and bill the full amount at one time. We may ship partial orders at any time, but will continue to deliver goods without any additional charges. Please call the store at 888.822.6840 within 5 business days from receipt of goods to obtain a Return Authorization number. Absolutely no returns or exchanges will be accepted without a "RA" number. Please mark the outside of the package clearly with the Return Authorization Number. Returned merchandise must be in the original packaging and in mint condition with any and all tags attached. Include a copy of your invoice, as well as an explanation for the return of merchandise. All exchanges and returns must be received by Cal Surf within 30 days from purchase date. No returns of sale or "as is" items are accepted. Shipping and handling fees are non-refundable. Additional shipping fees will be required to process all exchanges. Merchandise must meet all of the above listed criteria. Merchandise must be returned freight prepaid for an exchange or credit only. NO CASH REFUNDS. MERCHANDISE NOT MEETING THE ABOVE CRITERIA WILL BE REFUSED! We will attempt to cancel orders or items on an order if we are contacted within an hour of the order being placed. We attempt to package and ship each order as soon as possible after receiving the order and cannot guarentee cancellation. In order to make a cancellation request, please call 612.822.6840. All cancellation requests must be made via phone. If we are speaking with other customers, you will be asked to leave a message. Please leave a detailed message including your order number and contact details. If the order ships, shipping charges will not be refunded. You can be assured your credit card is safe while shopping at Cal Surf. We use a 128 bit Secure Socket Layer (SSL) for data encryption to protect the transmission of information while using our online shopping cart. Your credit card number and order details are scrambled during the transaction process. If you are not able to order using the shopping cart and need to provide us with sensitive information (credit card number, address, etc. ), we suggest you contact us via U.S. mail or via phone. Email is not a secure way to provide this type of information. We are confident you can safely shop over the internet, and enjoy the covenience of shopping at home. However, if you are concerned with using your credit card online, feel free to call our order department at 888.822.6840, where we will be happy to take your order. We at Cal Surf understand and share your concern for privacy. Cal Surf will under no circumstances distribute, sell, loan or rent any personally identifiable information regarding its customers to any third party. When an order is placed, we collect basic information including your name, home address, phone and email address. We use this infomration to confirm your order and to respond to any queries you may have for us. Cookies are used to keep track of you shopping cart. We hope you enjoy your Cal Surf shopping experience! Please do not hesitate contacting us!